World Series Superstars is another sports Facebook game from EA Sports and this time it’s baseball. In the game players take real life MLB stars and put them on their team. Players compete is minor leagues, exhibition and major leagues. To improve their team, players can d practice sessions but they must pick up their practice points before time expires to get credit for the practice routine. These points help to keep your team healthy and increase your rating. In the game store, players can buy player card packs and use those cards to add new players to their team. Players can’t control individual players during matches but they can influence the outcome by purchasing game changer moves such as stolen bases, singles, triples, and home runs. These moves cost game cash and expire after so many uses. 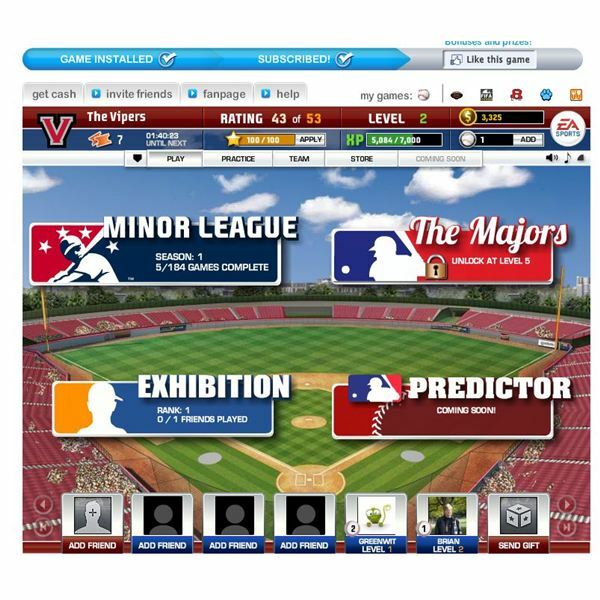 Players need fans for their teams and these are also purchased in the game store with different ball park upgrades such as lights or press boxes. Building your team in World Series Superstars is easy enough. In the game store you can buy different card packs from the cash you earn playing games. Players are rated according to stars so you can buy card packs with rated one players or card packs with rated five players. Of course, the higher level packs cost more coins and you’ll need to be a higher level to purchase them. In addition to new players, you’ll want to buy the game changers, which are special moves you can make during games. While you can’t control the individual players, you can use these moves to influence the outcome of the match in your favor. For example, you can steal a base; get a single, a triple, or a strikeout to win the game. These moves cost money and you’ll need to buy plenty of them since they expire after so many uses. Players can bring fans to their team by upgrading their ballpark with different items such as lights, a scoreboard, and so on. These ballpark items are purchased in the game store. Use the team screen to move players on and off your team and get ready for the next game. In World Series Superstars, you have several game types you can play. Beginners will want to start in the minor leagues to get a feel for the game before moving up to the major leagues at level five. In the exhibition mode, you can play against your Facebook friends. In the minor league mode, you’ll start in the current month with a series of games. You can’t play them all right away since your team will need to rest and practice too so there’s some realism to the games. 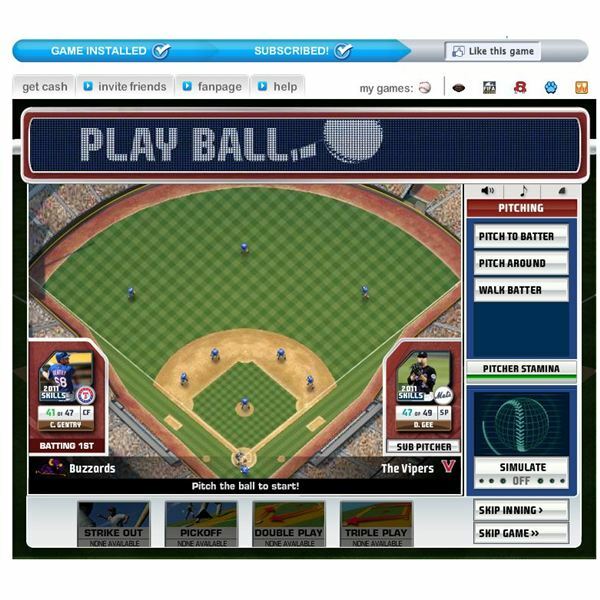 Once you take the field, you can play each inning and use your special moves or simulate the game and see the outcome. It can be fun to play the game yourself and you’ll learn how the moves operate but if you just want to move to the next game quickly use the simulate option. In general, World Series Superstars is a fun baseball game. It’s nice to open card packs and find one of your favorite players. The minor league games are great for helping you learn about the game and getting used to the special moves you can use to influence games. When not playing games you can use the practice mode and keep your team rating up. The game needs some statistics but that’s probably above the scope of this browser game. You won’t find the depth of the EA Sports console titles here but you’ll get a decent baseball game to play on Facebook. The graphics in World Series Superstars are minimal and the players during the game are very small but you can see the pitcher throwing the ball and hear a few sounds. The soundtrack is odd and not the best I have heard it needs improvement. The soundtrack is some bad bass, drums and random noises that isn’t much of an EA Sports track. During game play the track stoops and is replaced by some fan noises. On the multiplayer side, you can visit your friend’s ballpark and see their team or play them in exhibition mode. You can only play each friend once per day, which is very limiting in scope. 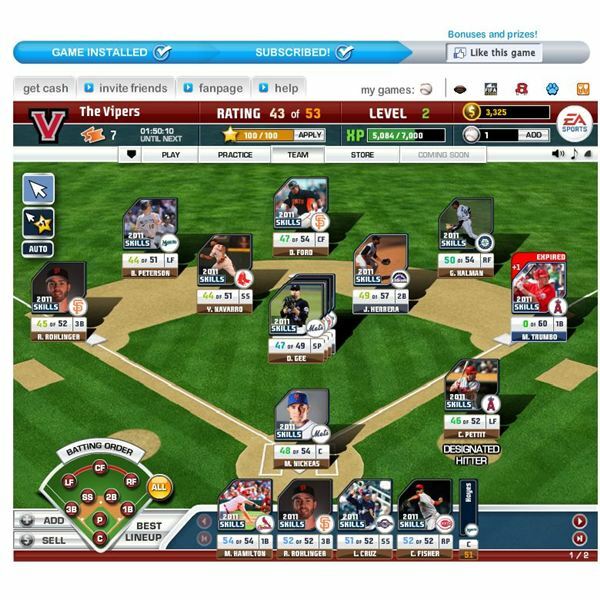 World Series Superstars is a decent baseball browser game but it needs improvement. A new soundtrack would be a nice addition, as would some in depth statistics besides the number of fans you have and your exhibition rank. This game would be fun for the casual baseball fan but if you want the full experience your better off playing the console version. World Series Superstars is still worth playing but don’t expect that much from the game. All images from World Series Superstars. Source: Article is author's own experiences playing World Series Superstars on Facebook.